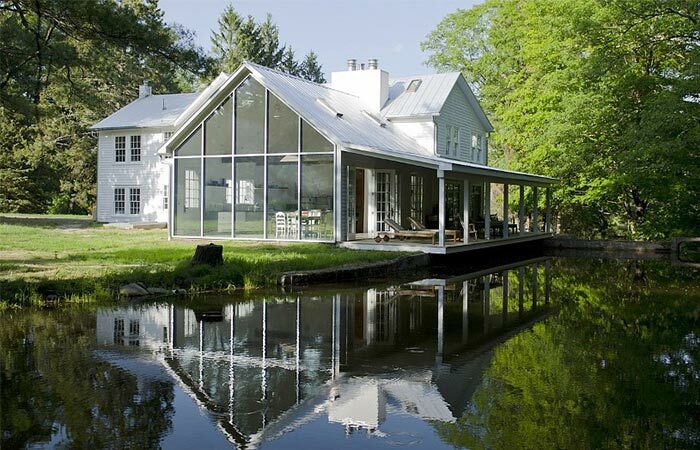 The Floating Farmhouse is a manor home from the 1820s, renovated with a modern touch. 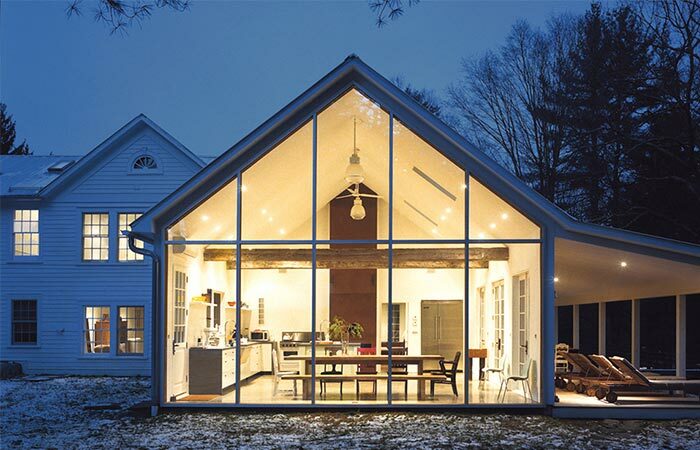 This 200-year-old home is nestled in the Catskill Mountains and is a result of years of work. Because of its cantilevered porch, it looks like the house floats on water in a creek located right next to it. The kitchen has a big glass wall that provides the view of the nature surrounding the house. The kitchen leads to the big cantilevered porch. The house is surrounded by natural landscape. It’s spacious and has four bedrooms and two bathrooms. The new design included some custom-made elements like the glass kitchen wall and polished concrete floors. 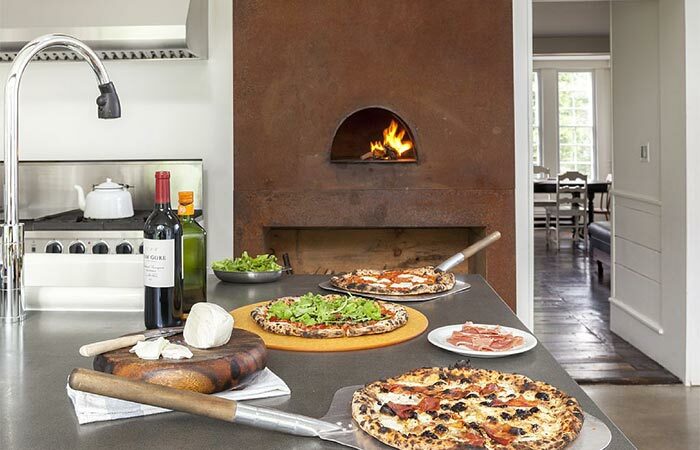 The kitchen also features a tall wood-fired pizza oven and a bright interior that additionally makes the room look bigger. It leads to the big covered porch that’s just next to the water. 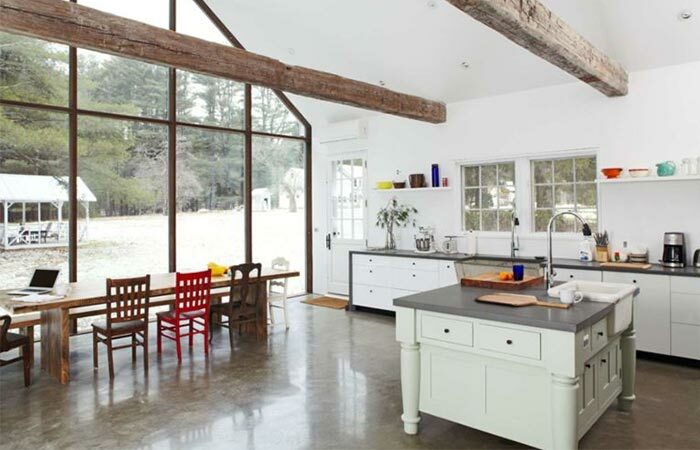 In addition to high ceilings, the kitchen also features polished concrete floors and bright furniture. A wood-fired pizza oven in the kitchen. As for the master bedroom, it incorporates old hand hewn beams and a fireplace. The rest of the bedrooms have traditional farmhouse furniture such as original cast-iron beds. The designer also used some vintage items for the Floating Farmhouse like a hand-chiseled 1700s Italian marble sink, an old turntable, and antique cast-iron radiators. One of four bedrooms, each one being decorated with old farmhouse furniture. 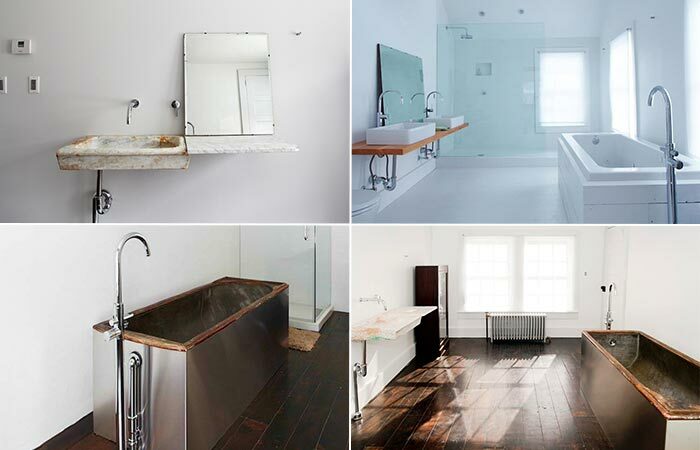 The Floating Farmhouse has two minimalistic bathrooms.